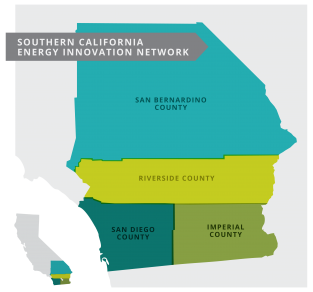 What is the Southern California Energy Innovation Network? The Southern California Energy Innovation Network (SCEIN) is a free program for startups that are developing solutions to help California meet its energy goals. The program provides access to the resources and facilities of a number of regional partner organizations (listed below) and connections with industry in order to accelerate the commercialization of emerging energy technologies. To date, 33 energy startup companies have been accepted into the SCEIN program. Together, these companies employ more than 171 people and have raised $25 million of private capital and $1.2 million of public funding. The program is the result of a five-year, $5 million grant from the California Energy Commission awarded in 2016 to advance the San Diego region’s energy innovation industry. What Business Services Are Available? Intellectual Property: The IP for an applying company’s technology must be either owned or licensed by the applicant’s company. Clean Transportation Technologies: Only electric vehicle infrastructure technologies and software platforms that manage the interaction of EVs with the grid are eligible for the program. SCEIN does not support companies with new vehicle or engine designs. For further details about this distinction, please contact alyssagd@cleantechsandiego.org. Applicants who pass the pre-screening process will be invited to present at an Entrepreneur Intake Session, where a selection committee will determine who is accepted into the program. CleanSpark: A fractal microgrid software platform and distributed energy resource management system that economically optimizes system operation for maximum value. The solution allows for remote monitoring and control and enables each section of a microgrid to function without a central command. Grid.Tech: A platform designed to help multifamily real estate investors increase their property values and secure additional monthly revenue while reducing tenant energy expenses. The company makes solar lucrative for multi-meter properties with shared roof space. Kitu Systems: IoT software products that solve the complex information and communication technology challenges faced by utilities, installers, and system owners who are interested in EV charge management, distributed energy control and monitoring, smart appliances, and load management activities. Aquacycl: The only modular and scalable sanitation technology capable of producing direct electricity (no methane) and recycled water from wastewater and sludge. The system generates a 50-80% reduction in overall operating costs for industrial and agricultural customers. CanCoverIt: CanCoverIt has created a unique attic insulation product that provides fast, easy, and comprehensive protection of all metal ceiling fixtures –from can-lights to exchange fans and more– for maximum building energy efficiency, comfort, and safety. Chilldyne: A leak-proof liquid cooling technology for data centers that uses a patented negative pressure design to save 20-40% on electricity costs and enables up to 10x higher density computing than traditional air-cooled systems. Conectric: A flexible, ultra-low-power wireless sensor networking platform that effortlessly delivers rich data to create smart buildings without complicated IT architecture, wiring and technical commissioning. Correlate: An innovative energy program subscription that helps businesses save energy with no time or budget requirements. For only $99 per month, Correlate develops, implements, and manages an onsite energy program that creates positive cash flow, easily, and automatically. General Engineering & Research (GE&R): A differentiated low-temperature cooling technology based on magnetic refrigeration that is lower-cost and more energy efficient than current technologies for cooling and storing cryogenic liquids. Occuspace: Provides a novel solution for reporting minute-by-minute indoor occupancy data that gives building owners the information they need to reduce total energy consumption by 10-20%, optimize space management, and improve the occupant experience. Icarus RT: A snap-on technology that boosts the power output of solar PV panels by cooling the panels, capturing the heat that would otherwise be lost, and using the collected heat to generate and store additional power. igrenEnergi: An intelligent Battery Management System (BMS) for making EV and stationary batteries more economically viable that is also applicable for optimizing output of solar panels. Primo Wind: Small, lightweight wind turbines that harvest energy in environments where wind speeds of 5-25mph prevail. These include a flower-shaped product called the EnergiPlant, which is an ideal solution for parks, universities, and business campuses looking for remotely-powered hubs with USB ports, LED lights, camera systems, 5G capabilities and more. Uprise Energy: A 10kW wind turbine that fits in a shipping container and sets up in one hour to produce clean, affordable electricity. The machine is most efficient in low wind speeds, allowing it to be conveniently located near customers that have historically relied on diesel generators for power. Smartville Energy: Developing an innovative battery reconditioning process that returns used electric vehicle battery packs to a consistent and uniform state-of-health in order to provide low-cost, easy-to-integrate, and reliable stationary energy storage solutions to customers. VLI-EV: A renewable energy solutions provider that offers proprietary controls software and super long life battery energy storage systems (new and recycled battery modules) with up to 25 year warranties that reduce customer energy and peak demand charge costs by 20-40%, as well as CO2 emissions. KIGT: KIGT manufactures the smallest, sleekest, and most affordable EV charging stations with vehicle-to-grid (V2G) capabilities and embedded software that manages, schedules, and bills charging sessions according to energy demand on the grid. NeoCharge: NeoCharge is dedicated to eliminating barriers to electric vehicle adoption and making it convenient to own an EV. Their first product is an inexpensive and intelligent 240-volt splitter that allows EV owners to use an existing 240-volt appliance outlet to fast charge their cars and save thousands of dollars in avoided charging station and electrician costs. Nuvve: A vehicle-to-grid (V2G) software platform that enables any EV battery to generate, store and sell unused energy back to the electric grid in a bi-directional manner. The Technical Advisory Committee aids in the screening of entrepreneurs/technologies that are seeking support from the program. The committee is composed of diverse professionals from the private, public, and academic sectors who have domain expertise across the broad scope of technologies that span the evolving energy industry. Mentors support Cleantech San Diego staff in ensuring smooth operation of the program by checking in with assigned Southern California Energy Innovation Network companies on a monthly basis. Mentors assess how program service delivery is going, keep track of progress on critical business milestones, and offer tailored guidance to mentees.